Tudumo is carefully designed to keep the user interface elegant and to allow you to filter your tasks in an intuitive way. No more information overload - every feature is hand-crafted to help you focus on your most important work. Tudumo is carefully designed to keep the user interface elegant and to allow you to filter your tasks in an intuitive way. 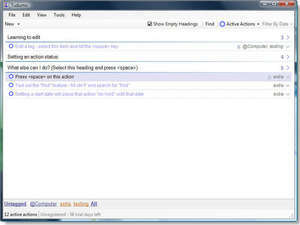 Tudumo 1.0 is a shareware program and can be used as a demo to try the software until the free trial period has ended. A full version of the program is available after the trial period ends. For security reasons, you should also check out the Tudumo download at LO4D.com which includes virus and malware tests. Additional screenshots of this application download may be available, too. 3.8 out of 5 based on 11 ratings.